Autumn is such a beautiful time of the year, but with it comes a sort of melancholy feel. Those who love summer and live in the northeast understand what I am saying. As the warmer weather begins to fade, the leaves start floating gracefully down from the trees, and we are reminded once again that winter is just around the corner. Many feel sad that the warmer months are behind us, wishing if only they could have captured that time better as it slipped so easily away from them. How about instead of lingering in the past and what we wish we could still have, we appreciate what is right in front of us. Gorgeous colors, the growth of new fruits and vegetables, and a cooler, crisper air to wake up to. These things are perfect in their own way. So instead of wishing we had more of the summer, let’s open our arms to fall and everything that comes with it. 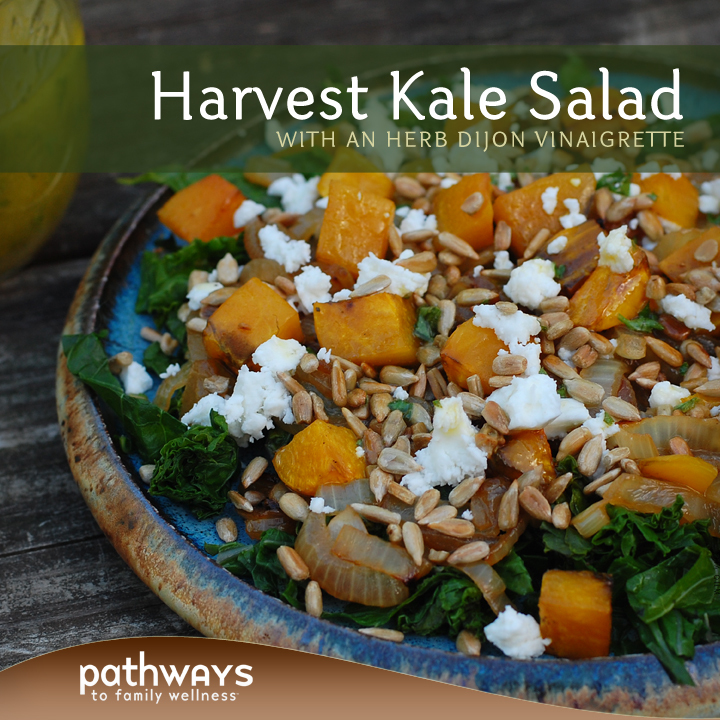 For this recipe we wanted something slightly different that still says “fall” in the colors and flavors. 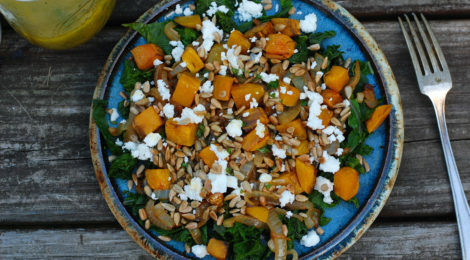 Instead of opting for the famed sweet potato or pumpkin, we used golden beets. Rather than walnuts or pecans, we chose toasted sunflower seeds. No raw red onion used here, instead we caramelized yellow onion. Topped with feta (or blue cheese if you are feeling daring) is the perfect balance of salty to sweet. And everything is cooked to allow for easy digestion for the best absorption of minerals. The herb dressing is a classic. When we make a dressing it is pretty much some derivative of this recipe, and we love it just the way it is with any type of salad. Here the apple cider vinegar works perfectly as a fall addition, and the herbs, well, who doesn’t love a touch of something fresh and green? As the months continue to roll over, let’s look at this change as something to welcome and be grateful for rather than something to resist and reject. There is beauty in every season, every month, every week, every day, and every moment. Let’s open our eyes to that and enjoy it for what it is: exactly what we need at this moment in time. This will make more dressing than you need for this recipe. Save the rest in the fridge for your next salad. Peel and chop your beets. Add to a baking pan with drizzled olive oil or a bit of butter and a touch of salt. When the oven is preheated, put in your beets and cook for about 20 minutes or until soft. Set aside. Fill a medium sized pot of water half-way and bring to a boil. Add your stemless kale and blanch for about 3 minutes. Drain and let cool. Chop into smaller pieces. In a medium sautée pan, melt 1 T butter. Add your onions and cook on medium-low for about 15 minutes or until caramelized and nicely browned. Add some sea salt to taste and remove from heat and set aside. Whip up your dressing by adding all ingredients to a jar with a lid and shake well. Begin to arrange your salad by selecting a bowl or plate of choice. 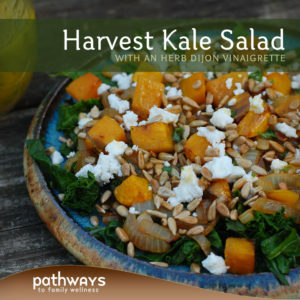 In this order add blanched kale, caramelized onions, beets, feta, and toasted sunflower seeds. Dress with your herb vinaigrette and add a bit of sea salt and pepper if desired.